Wild card entry Benjamin Hassan advances to the second round of the ATP Challenger 80 event. 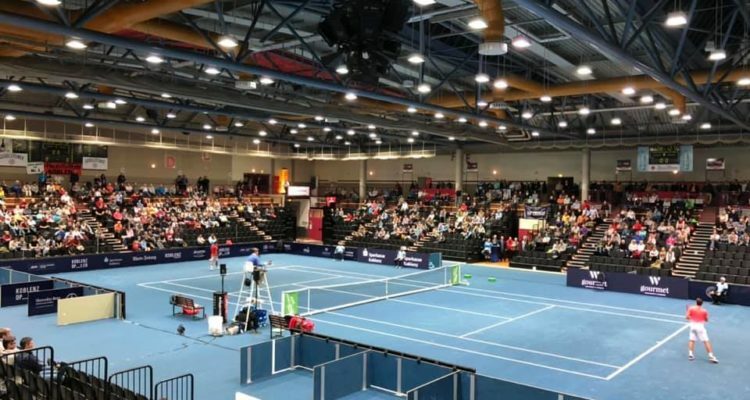 Carlos Taberner of Spain and Russia’s Pavel Kotov caused the biggest upsets of the day at the Koblenz Open. Both players knocked out seeded players to advance to the third round of the ATP Challenger 80 event. Taberner, who suffered from an abdominal injury and missed almost the entire second half of last year’s season, snapped a four-match losing streak in the opening round with a three-set victory over German wild card entry Julian Lenz and beat No. 5 seed Daniel Brands on Tuesday. The 21-year-old from Valencia broke the big-German’s serve three times to secure a 7-6(2), 7-5 win in one hour and 57 minutes. Taberner will next face another hard-hitting opponent, meeting Frenchman Kenny de Schepper, who cruised past José Hernandez-Fernandez of the Dominican Republic 6-2, 6-1 in only 53 minutes. Pavel Kotov knocked off No. 4 seeded Italian Andrea Arnaboldi 6-4, 7-5. The 20-year-old Moscow native, who is currently ranked on a career high World No. 343, sent down seven aces, winning 77 per cent of his first service points to prevail after one hour and 31 minutes. Next up for Kotov will be either No. 15 seed Thiemo de Bakker from the Netherlands or local hero Benjamin Hassan, who entered the main draw with a wild card and opened his home campaign with a 6-4, 6-2 win over Croatian youngster Nino Serdarusic. The tournament’s top seed Casper Ruud will start his title bid on Wednesday facing ITF-entry Raul Brancaccio of Italy. Second favourite Yannick Maden will take on Italian lucky loser Riccardo Bonadio, who replaces Alex Molcan, as the 21-year-old from Slovakia suffered from fever. No. 3 seed Alexey Vatutin of Russia will be challenged by Portugal’s Goncalo Oliveira.